Facelifting their popular models is becoming a tradition among car makers across the globe. It’s the easiest yet professional way to regain customers. 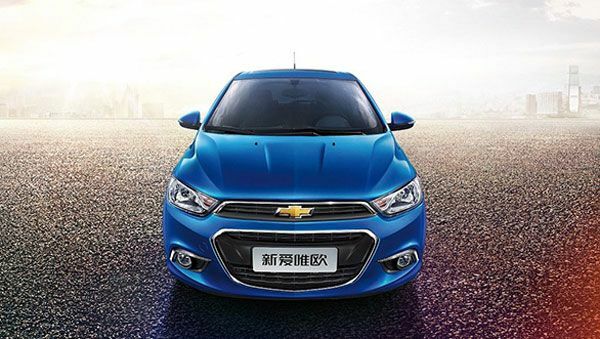 To carry the trend ahead, General Motor has planned to launch the facelift version of its popular Chevrolet Aveo in China this June. Aveo has a huge popularity as a family sedan in China. GM expects to continue the success story of Aveo with the new 2014 model in the world’s one of the biggest car markets. The 2014 Aveo has got a smart, fresh and sportier look with Chevrolet’s new design theme ‘Design with a Heartbeat’. Chevrolet has reportedly redesigned the new Aveo after an extensive market research through existing customers’ feedbacks. GM’s Shanghai based Pan Asia Technical Automotive Centre (PATAC) has reportedly designed the new model of Aveo. The all new Aveo sports the Chevrolet’s traditional small dual-port grille with redesigned integrated angular headlamps. The grille has become wider and carries the gold colored Chevrolet insignia borrowed from Cruz. The slightly extended front bumper carries fog lamps with chrome finish. Sides are smooth with metal accents and body colored side view mirrors with turn indicators in the new Aveo. The rear has got a lift with butterfly shaped tail lights to give it a wider rear look. The premium sedan in its new avatar features concealed exhaust pipe design and eight-spoke 16-inch alloy wheels to provide a more stable and controlled drive. Chevrolet hasn’t revealed the engine specifications of the new Aveo but there are reports that the redesigned compact sedan will feature an Ecotec DVVT engine mated to a 6-speed automatic transmission. The current model of Aveo comes in two engine variants – 1.4-litre engine good for 97bhp and 1.6-litre engine good for 119bhp. The new Aveo is claimed to have a luxurious interior with ample of safety features. It has got power steering with audio controls and a touch screen system fitted in the centre console. 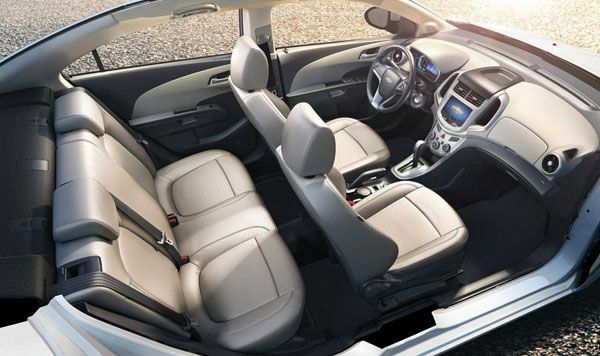 Comfortable for five, the all new Aveo is spacious and smart from inside. Complete specifications are expected to come out as soon as the car goes on sale in China. Aveo, the compact sedan has been immensely popular in China. GM has reportedly sold around 3.2 million units of Aveo here till date. There is no report on its Indian launch yet. Founded in 1911 by Louis Chevrolet and William Durant as Chevrolet Motor Car Company, Chevrolet, Chevy or Chev is the automobile division of popular American car manufacturer General Motors (GM). Chevrolet also produces commercial vehicles including trucks along with passenger cars. Chevrolet also provides vehicle finance, vehicle insurance and vehicle repair services to its customers. 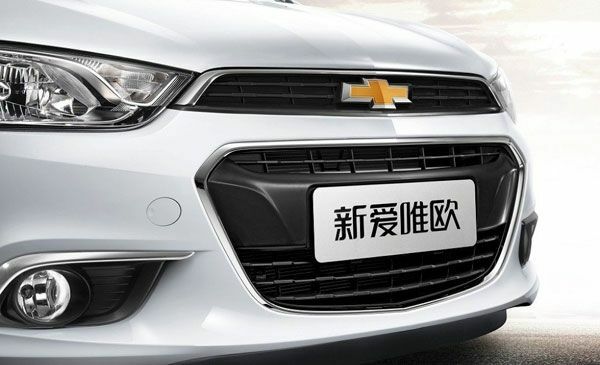 US, Brazil and China are Chevrolet’s biggest markets in terms of sales. Chevrolet has a decent presence in the Indian automotive market as well. The company started its Indian operations way back in 1928 with an office in Mumbai. Interestingly, Chevrolet was the first automobile company to open an assembly plant in India. Chevrolet offers a decent range of models in the Indian market including Chevrolet Spark, Chevrolet Beat, Chevrolet Sail, Chevrolet Tavera, Chevrolet Cruze, Chevrolet Aveo, Chevrolet Tavera and Chevrolet Captiva.